Moonbot Studios, Shreveport, wins praise from Wired.com for evolutionary changes in the iPad app for "Morris Lessmore"
Of the iPad app which makes an adventure of Moonbot Studios' "The Fantastic Adventures of Mr Morris Lessmore," writer Daniel Donahoo, Wired.com, says, "Well, sometimes in the shifting sands of technological evolution it doesn’t take much to shift expectations. The iPad itself only changed things from a child development perspective because it had a bigger screen size. This app, this story, changes things because of the new approach to content. Sure, Disney and Pixar have put their stamps on 3D animation on the iPad, but Moonbot Studios does it with a whimsy and emotion that only appear in Pixar short films these days. And that will mean a lot to children and adult readers alike. The quality of the graphics and interactivity with the images is high. Beautiful audio prompts, like in one scene (these are not pages as we’d traditionally know them; their animation makes them more) all you hear is a knocking, and you eventually realize you need to touch the door to open it and let Morris out. Simple, but effective and a playful discovery that adds to the story of scattered books that can help you fly. In a nutshell: gorgeous animation, inventive and playful interaction and quality content." There's more on Lessmore under the Geekdad column by Donahoo. "My friends Rene Duffourc and Jacques Duffourc and I are in town doing an interactive puppet theatre adaptation of Fantastic Mr. Fox," writes Arthur Mintz. "In our show, the audience literally climbs into the picture frame of an enormous story book and through 13 chapters of the story. Each of the sets is interconnected by underground tunnels, slides, and rope courses. We ran the show for over a year in New Orleans and were just invited up here by Bill Joyce. The show will open at ArtSpace in October." "We are currently in town building the show, and are having auditions for actors and puppeteers this Saturday, June 4th, from 10am to 4pm. No experience with puppets is necessary." 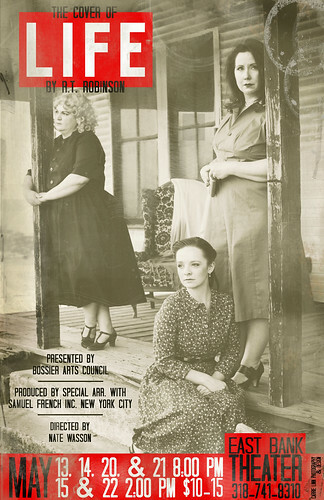 Having seen the puppets, heard the plans, researched the New Orleans run online and met the charming trio of producers, I must give this project my highest recommendation. At the very least, go meet these lads and enjoy their spiel! Grace Bareikis, Shreveport, a photo by trudeau on Flickr. Books continue to outlive the many declamations about their demise. 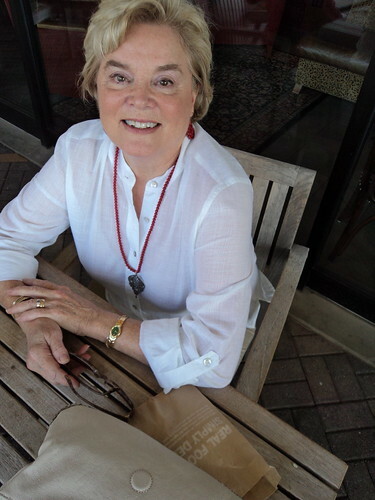 Grace Bareikis, Centenary Book Bazaar, says the next assisted book drop date for book recycling through the Bazaar is Mon, June 13, at the Book House, 108 E King's Hwy - across from George's Grill. Volunteers will be plucking books from vehicles from 9 am to 3 pm. CDs, DVDs and videotapes in good condition are also accepted. Condition is important to the resale value of a book. Not requested are textbooks over five years old (other than literature and history), Reader’s Digest Condensed Books and National Geographic magazines. Achtung, teens and parents: Summer reading list books are sold dirtly cheaply at Book House all week, says Bareikis. The annual Centenary Book Bazaar is held the Fri & Sat after Labor Day. This year some 80,000 items will be offered. Mozart's Symphony No. 25, The Elgar "Enigma Variations", the Louisiana premier of "No Sound of Trumpet nor Roll of Drum - Reflections on the Civil War" written and conducted by Kermit Poling, and two arias sung by gifted soprano Icy Simpson. for every one who has, or has had a dog., a photo by Aiko, Thomas & Juliette+Isaac on Flickr. 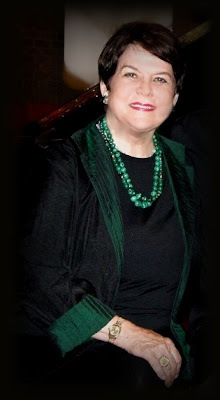 "The Mary Jane Malone Lecture Series author for the 2011-2012 school year will be Garth Stein," said Kris Clements. "He will spend the day ay Caddo Magnet High onTh, Oct 20, and will give an entertaining lecture that evening at 6:30 pm. The event, free and open to the public, will be held in the Magnet PAC." 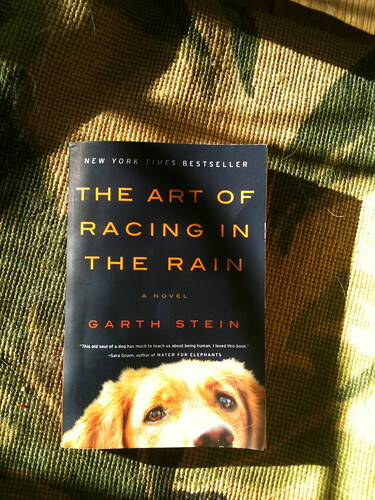 Stein's recent novel, The Art of Racing in the Rain (Harper, 2008) became a New York Times bestseller and a #1 BookSense Pick, says Wikipedia. The novel follows the story of Denny, a race car driver, and his dog Enzo, who believes he will be reincarnated as a human — following the Mongolian legend that a dog who is prepared will be reincarnated in their next life as a human. Erick Coleman, Meadows Museum, Shreveport, a photo by trudeau on Flickr. 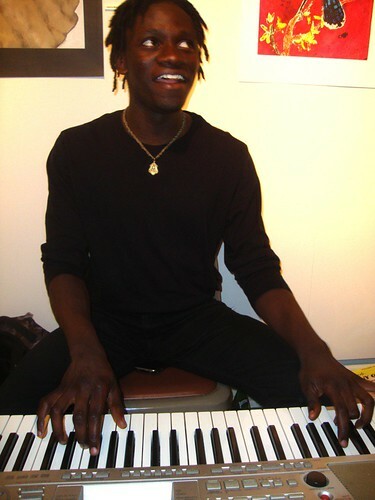 "Erick Coleman and Friends will be playing at El Chico - Fern Ave. at Madision Park on Friday, May 27, at about 5:00 pm. Drop by if you get a chance," writes Deborah Coleman. Having worked with Erick in theater and on video, I can recommend Coleman for his gospelly jazz and for his fluid improv. He is young but wise and hard-working. Cedryl Ballou & the Zydeco Trendsetters, a photo by Daniel Humann on Flickr. Two things about finding fiery young zydeco talent on the Mudbug Fest stage: your crawfish taste saltier and all of a sudden you find you can dance like a coffee bug under an Evinrude. That's what I'm predicting will happen to those savvy enough to do zydeco lunch with Cedryl Ballou & the Zydeco Trendsetters at Mudbug Fest on Thurs and Friday, 11 am - 2 pm. Cedryl is from a well-known Creole family. Seated on stage stroking a Gibson guitar while Cedryl and his brother and cousins hop up and down will be the eminent Classie Ballou, a legend in swampland R & B.
Cedryl is age 25 and is not married to zydeco traditions. All he seems to want is to talk tabasco. Check those myspace recordings to get your blood pressure up. Hope you'll read fellow enthusiast Chris Jay's article on his favorites at Mudbug Fest; it follows mine. We took different points of view. As a fan and writer, I responded to his cayenne throwdown. Et lache pas la patate, ya'll. I'm excited about seeing many of the performers scheduled to appear at this year's Mudbug Madness, which kicks off Thursday and runs through Sunday night, including Wayne Toups and Zydecajun, Lil' Nathan and the Zydeco Bigtimers, and Dwayne Dopsie and the Zydeco Hellraisers (featured in the video above). It seems like 2011 has been a better-than-average year for Cajun and Zydeco music fans in Shreveport-Bossier, starting off with Sam's Town Live appearances by Rockin' Dopsie, Jr. and Jo-el Sonnier early in the year, and continuing with a fun Mudbug line-up. Over at the SBCTB Blog, I go into more detail about a few acts I'm excited about, but my #1 must-see is Dwayne Dopsie. 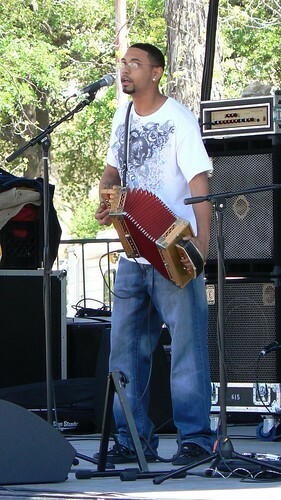 Son of Zydeco pioneer Rockin' Dopsie, Sr., Dwayne has played the accordion since age 7. He's a notoriously rowdy and out-of-control player, prone to flashy solos that demonstrate his virtuosic control of the instrument. 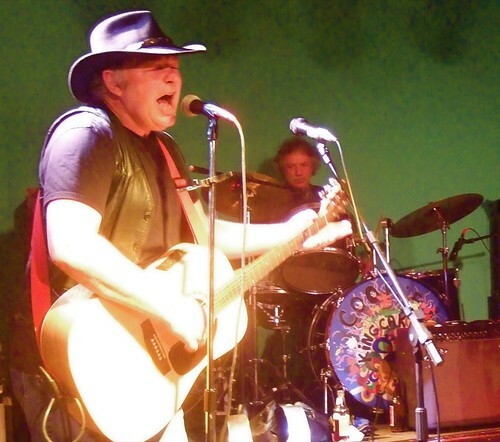 Live, he's known for breaking out bizarrely awesome rock covers that substitute the accordion for the guitar, such as Jimi Hendrix's "Hey Joe," seen in the video above. Dwayne Dopsie performs at 8 p.m., Sunday, May 29 at Mudbug Madness. For more details on the festival, click here. To see the full line-up of performers, click here. If you're a food lover in Shreveport-Bossier, chances are you've heard mention of Big O's. In my case, I'd heard rave reviews of the fried fish and shrimp and, especially, the homemade tartar sauce created by owner Odis Johnson. When people rave about something as seemingly hard-to-mess-up as tartar sauce, I'm always pessimistic. How special could tartar sauce be? The answer, as it turns out, is "really, really special." Not just the sauce itself, but the larger-than-life character behind the sauce, Odis "Big O" Johnson, who claims that the recipe for the sauce came to him in a dream. "It was the night before my wife and I's anniversary," Big O said. "I was planning a big fish fry for the next day, a Sunday. That night, I had a dream. In the dream, I was shopping for all of these ingredients. I bought seven kinds of pepper. I bought Hellmann's Mayonnaise. I remember thinking: do they even carry seven kinds of pepper? I'd never made my own tartar sauce, I'd just bought it at the store. I woke up from that dream, I woke my wife up, and I said: 'I'm making my own tartar sauce today.'" Happy anniversary, honey! Later that day, at the fish fry, Big O's family went haywire over the sauce. His little brother, who was first to try it, encouraged Big O to sell it commercially, as did several other friends. The rest is history. Delicious, crispy, golden fried history. Big O's is located at 1129 Villaggio Boulevard in Bossier City. If you're looking for it on a map, it may be best to search for Villaggio's street address, which is 5200 East Texas Street - just off of Highway 80, east of Industrial Drive. Lunch specials are $8.50 and entrees are in the $10-$15 range. A kids menu is available with $5 kids plates. I especially recommend the fried shrimp, which have an unusually light and flaky, almost tempura-style breading. View a slideshow of images from Big O's. 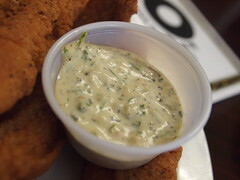 Ponder an extreme close-up image of the tartar sauce in question. 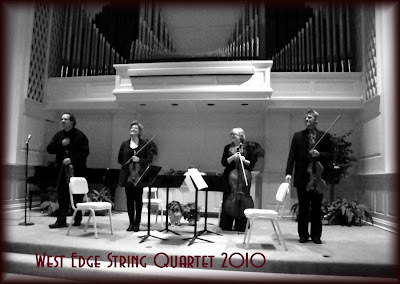 Dr. Lester Senter Wilson, Executive Director for the prestigious Wideman Piano Competition, is offering music lovers a gift this Saturday May 21, 2010, Wideman Competition winner pianist Ko-Eun Lee and The West Edge String Quartet, in concert at Frost Chapel, First Baptist Church. 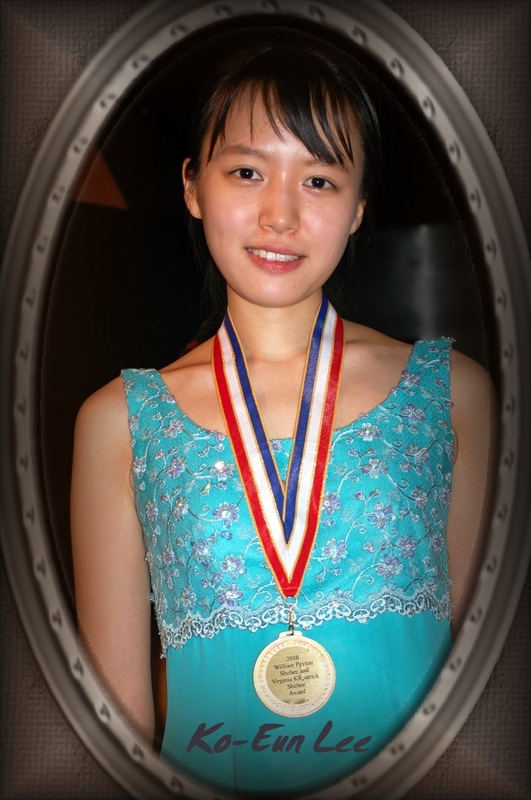 Ms. Lee who won the finals of the 2010 competition in January 2011 when she played with the Shreveport Symphony Orchestra along with two other finalists has returned to Shreveport for a free chamber concert with the West Edge String Quartet. River City Rep at Southfield School, a photo by trudeau on Flickr. River City Rep takes its audience to a "site specific" location for the Tony Award winning musical, The 25th Annual Putnam County Spelling Bee, says Patric McWilliams. 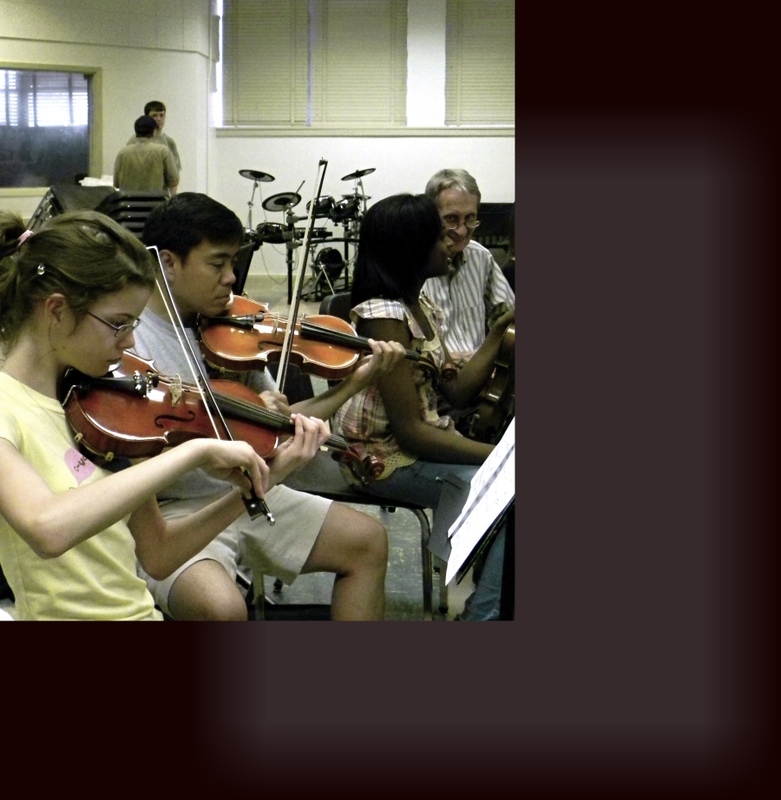 Recall those days spent in school auditoriums when you enter the theater at Southfield School for an evening of musical fun. 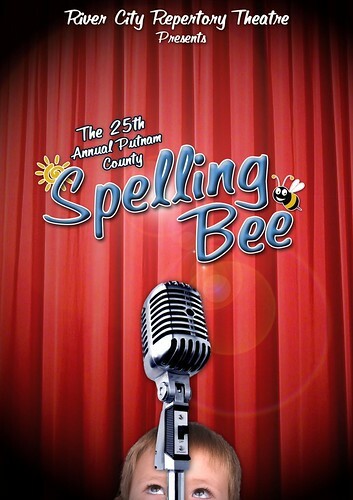 The 25th Annual Putnam County Spelling Bee is a hilarious musical about six adolescent outsiders vying for the spelling championship of a lifetime. The Robinson Film Center’s monthly Freak-Out!, an ongoing series of late-night screenings of vintage horror, comedy, and cult classics, will present the outrageous 1980 spoof Airplane! at 10 p.m., May 20-21. Executive Director Alexandyr Kent said that the screening will be unlike any other that the RFC has ever hosted, in that it will be a “quote-along” event, with fans encouraged to shout out lines of the film as it plays. “We’re encouraging our patrons to do what they’d do at home,” Kent said, adding that RFC is also planning an interactive, sing-along screening of 80’s comedy/musical Little Shop of Horrors. In addition to the screening, there will be a special, movie-themed cocktail available at Abby Singer’s Bistro (a “Don’t Call Me Shirley Temple”), as well as a pre-movie presentation mocking flight attendants and flight safety instructions. Custom-made “How to exit the theater in an emergency” cards will be placed in seats. The Robinson Film Center is located at 617 Texas Street in downtown Shreveport. Visit their website for tickets or more information. The Student League of Art and Design hold 1st Annual Juried Art show. The Student League of Art and Design (SLAD) at LSU-S, will be hosting their first annual juried art show at the Bossier City Arts Council, Tuesday, May 17 from 7 to 9PM. The art show will feature student-created works inspired by this year’s theme, We Only Come Out At Night, and will range in different mediums from watercolor, to block printing, graphic design and mixed media. Artworks will be critiqued and judged by National shown artist, Deborah Allen, who will administer awards to Best in Show, first, second and third places. Refreshments and a liquor bar will also be available for guests. The event was formed in order to offer students an opportunity to exhibit an original piece of artwork (per their interpretation of the theme), and to expand appreciation of the arts at LSU Shreveport. Oh, Really exhibit, Artspace Shreveport: Talbot Hopkins, a photo by trudeau on Flickr. Painters Talbot Hopkins, Laura Noland-Harter and, from Manhattan, Kansas, Phyllis J Pease, have been brought together for a show at Artspace Shreveport by a long-time friend, Artspace artistic director William Joyce. 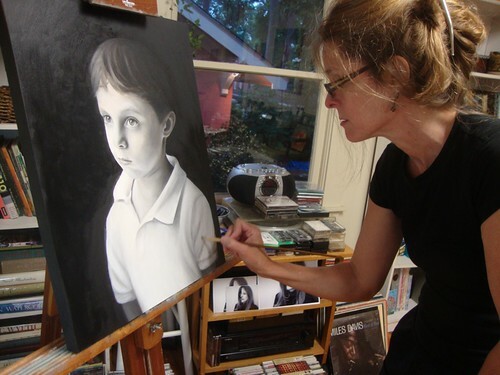 Each produces paintings with a realist's edge; the exhibit is being called, "Oh, Really." The Opening Reception for "Oh, Really" is Friday, May 20th from 5:30 - 8:00 pm at artspace, 710 Texas Street, downtown Shreveport, says Julia Foley. Admission is $10 and includes hors d'ouvres and live music. A cash bar will be available. giftspace @ artspace will feature the artworks of local artist Karen Johnson. Parking is available in the Blue Scroll Mural lot at the corner of Texas and Common Streets. Talbot Hopkins and Robert Trudeau will discuss her new work and that of Harter and Pease on Mon, May 16, at 5 pm on KSCL, 91.3 fm. Stream the on-air chat at KSCL.FM. Local actor John Chambers appears in latest episode of HBO's "Treme"
appears in Episode #203 of HBO's Treme. If you were on facebook Saturday night during the broadcast of the HBO series Treme's thirteenth episode, entitled "On Your Way Down," you may have seen a flurry of wall posts that read, in summary: "OMG is that u on Treme, John Chambers?!" Indeed, it was Mr. 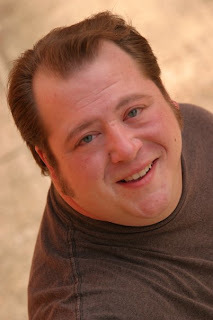 Chambers, a hard-working local actor who has appeared in dozens of stage productions (my personal favorite being the Gilbert and Sullivan Society's hip-hop Shakespeare adaptation Big Willie Style: Port City) as well as the Infamous Web Series. In Treme, John appeared as a hard-nosed, strictly by-the-book claims agent for the Road Home program. In the episode, he refuses to bend the rules to help one of the main characters process an insurance claim. Always careful to be humble, John is quick to point out that he was "just a day player." But I don't mind saying it: Treme is already being hailed as one of the greatest television shows of all time, and writer and creator David Simon also created the venerable The Wire and NBC's Homicide: Life on the Streets. John may have just been a day player, but I'd be honored to deliver pizza to that set. John filmed for one entire day on December 13, 2010. "It was intimidating, and it was impressive to see how they worked," John said. "It was a seamless cast and crew, everyone knew exactly where they were going with the material." John had never seen Treme until two days before he made the drive to New Orleans to appear in the show. He was impressed by the fact that a great deal of energy is put forth by the producers to hire local. "Almost everyone on the set is local, the entire crew and almost the entire cast. That really seems to help them capture the local feel." 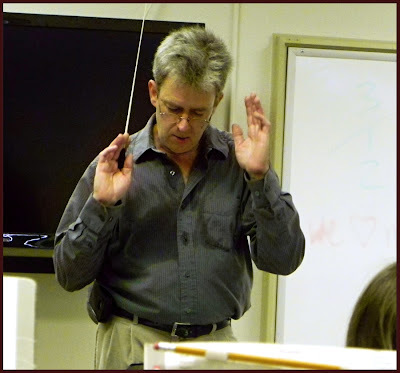 Conducting the "side by side" segment of the program will be its Music Director, Christopher Allen. 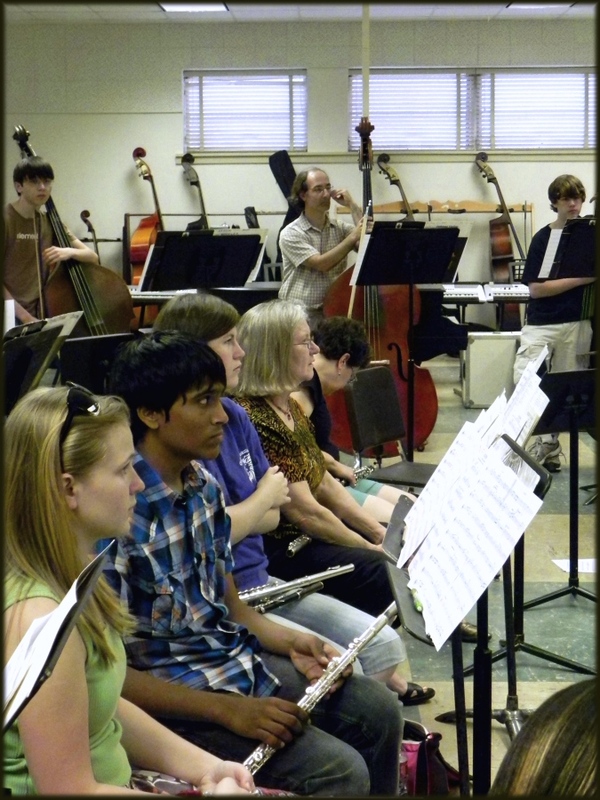 Beverly Houston will be conducting the ALTYSO Sinfonia comprised of the organization's younger students. What a treat it has been for me as a professional Horn player to participate in this annual event first held in the old Expo Hall, then at the riverfront parkway amphi - theatre and in recent years in the Byrd High School auditorium. I am told that the students eagerly look forward to this event with great anticipation through out the school year. Imagine, your opportunity to play a concert with professional musicians seated right next to you on stage!! 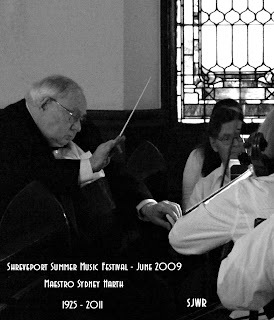 Many years ago I experienced this rare opportunity in the late 50's when the SSO with Music Director, Maestro John Shenaut, needed extra horns to play some Richard Strauss. My friend Judy Causey, (who will be playing in this side by side concert with me) my sister Donna and I (all three of us high school band students at FPHS) were asked to join the orchestra for the Strauss selection, Don Juan. 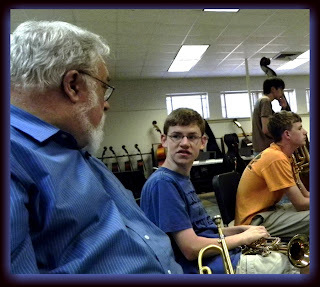 From the moment I first sat down amongst the hallowed and revered professionals I felt as though I were in culture shock and I couldn't imagine how those horn players could play so loud and so perfectly, but the word "nervous" was not in our young vocabulary at the time and the professionals coached us through the piece until we were convinced that we would actually add to, not take from the performance. 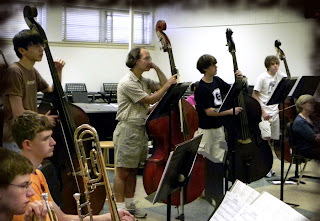 It was my first experience playing in a professional orchestra and I never forgot it. 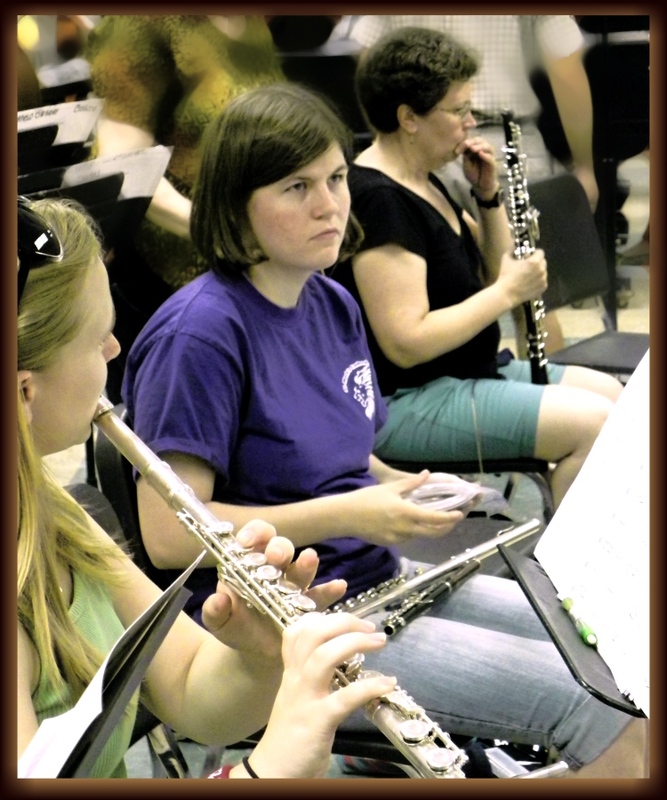 Below are a few candid shots from our rehearsal in the C.E. Byrd band hall with the ALTYSO musicians. I will be posting the concert photos on my blog later this week. PinkParty2010, a photo courtesy of Bucky Crouch on Flickr. It's time to get pink. The 18th Annual Pink Party will take place at the Shreveport Convention Center on Saturday, May 14, from 8 p.m. – midnight. Shuttle service will be provided from 11:30 p.m. – 2:30 a.m. to allow for attendees to have transportation to the official after party at Central Station, which begins at midnight. Hosted by Pink Party, Inc., the Pink Party began in 1994. Today, the event is one of the area’s largest fundraising events for local nonprofit charities, specifically Easter Seals, the Philadelphia Center and PACE. This year, the organization has the highest record revenue to date in sponsorships, said Co-President Bucky Crouch. Sponsor revenue goes to support the Philadelphia Center and PACE, and patrons are recommended to pay a $10 donation to Easter Seals upon arrival. To kick off the festivities, a “Dine with Pink” party was held at Bella Fresca Thursday evening. Today, from 7 p.m. – midnight, all are invited to attend the Pre-Pink Party complete with a live auction which will include over-size pink pumps signed by celebrities. The Pink Party will be Saturday, and a brunch at Bistro Byronz will follow on Sunday morning. Dan Garner, Shreveport, a photo by trudeau on Flickr. Christian Services, says Paula O Neal. as a part of the "Rendezvous on the Red" series. The Cover of LIFE / East Bank Theater May 13 - 21, a photo by trudeau on Flickr. "Tood, Weetsie and Sybill are brides in rural Louisiana in 1943. Each married a Cliffert brother. The men are off at war and a local news story about these young wives keeping the home fires burning intrigues Life magazine publisher Henry Luce," writes director Nate Wasson of The Cover Of Life. "He decides that they belong on the cover Life Magazine and assigns Kate Miller to the story. She has been covering the war in Europe and she views doing a "women's piece" as a career set back." Shreveport Symphony Orchestra, Sat, May 14, 7:30 pm, a photo by trudeau on Flickr. 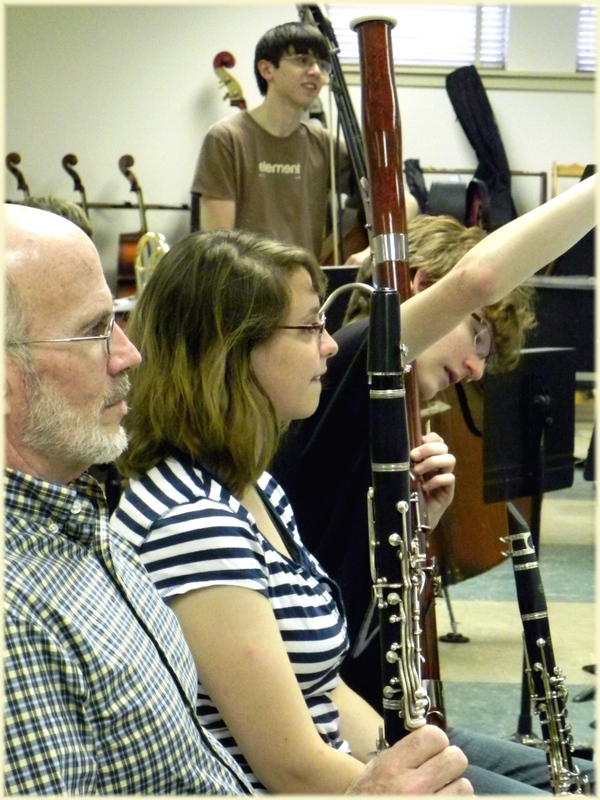 It's the season finale concert this weekend, writes Leah Escude. 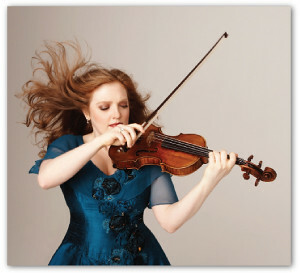 The SSO features guest artist Rachel Barton Pine, violin, in the Riverview Theater concert on Sat, May 14, 7:30 pm. SMETANA - Three Dances from "The Bartered Bride"
Our season closes in Central European style as we hear world-renowned violinist Rachel Barton Pine in her acclaimed interpretation of the incomparable violin concerto of Johannes Brahms, says Michael Butterman. Dvořák's masterful Symphony No. 7 showcases our orchestra's prowess in one of the best-loved staples of the symphonic repertoire. Free shuttle service starts at 6:30 pm. It runs from the Regions Bank parking garage at the corner of Milam & Market Streets. 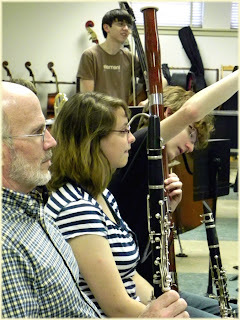 Music Director Michael Butterman discusses the SSO's May concert in a fun, informal cocktail party setting. This event is FREE and open to the community. Support the SSO with the Pack your Bags Raffle! Check out the trips and other prizes & get tickets online! The raffle drawing will be held at this weekend's concert. Winners need not be present to win. 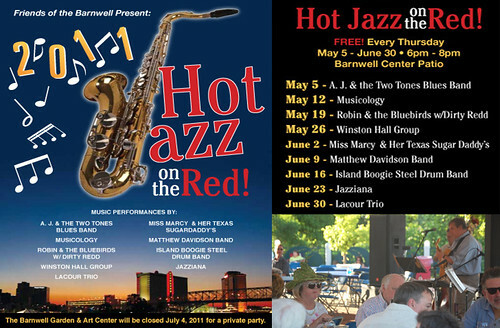 Barnwell's Hot Jazz on the Red on Thursdays, a photo by trudeau on Flickr. P1050095, a photo by danny.fitzgerald on Flickr. "Join Tim Fitzgerald," writes Ian Webb, "on May 15th for a 10-hour road bike ride to raise money for an Aquatic Center at the Broadmoor YMCA." 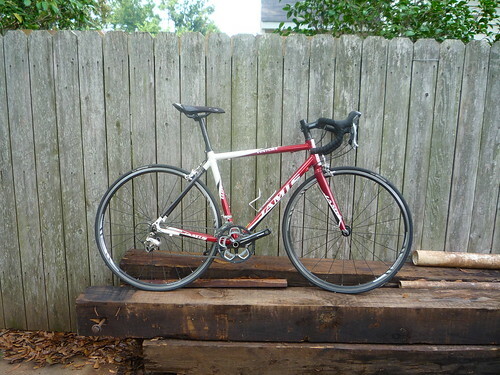 "River City Cycling will be there to support the ride, and some of our employees will be riding to raise money. You can ride as an individual or team, or pledge money in support of the cause. This is a great opportunity to help your community while doing a fun ride!" Pardon the unusually exuberant post, but I've just been given a "sneak peek" tour of the rare book library of the R.W. Norton Art Gallery by Jennifer DeFratis, tour and special event coordinator for the Norton, where "the largest wave of changes to the gallery since it opened in 1966" is underway. The Norton's library has become something of an urban legend in Shreveport-Bossier. DeFratis says that the project, five years in the making, will be completed and will open to the public this summer. She actually threw out a specific date, but asked me not to share it. I feel I can say this: the library looked to be very near completion. The books are on the shelves (as of Tuesday) and statues and busts of great writers and thinkers are being put in place. Among the most exciting elements of the library is a beautiful new display case for the Norton's breathtaking double elephant folio edition of John James Audubon's "The Birds of America." The crowning jewel of the Norton's rare book collection, the Audubon book is said to be worth $11.5 million. The new case will make it possible for museum staffers to change the pages of the book more often, DeFratis said, indicating that a different print would be displayed each month. Other glass cases, which line the walls on one side of the room, will allow viewers to see a regularly-rotated exhibit of books from the collection. DeFratis said that other ways for the public to enjoy this incredible collection are currently being discussed. The Norton has also just completed a remodeling of their Charles Marion Russell gallery and are currently creating a Pre-Modernist gallery. DeFratis cites "new leadership" as the driving force behind all of these changes. "There really is a renaissance under way here," she said. Cinco de Mayo Fiesta, Shreveport, LA, a photo by sbctb on Flickr. The Hispanic community of Shreveport-Bossier will offer a celebration of the food, music, and culture of Mexico during the 14th annual Cinco de Mayo Fiesta to be held Saturday, May 7, 9 a.m.-midnight, in downtown Shreveport’s Festival Plaza, says Chris Jay. 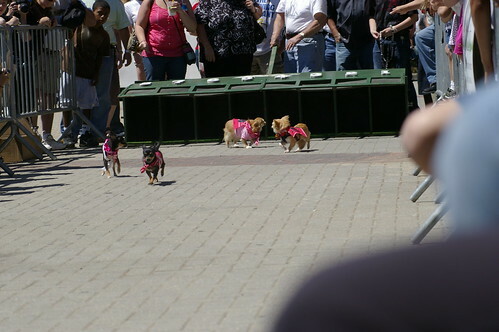 See live music, children’s activities, a free health fair, canine contests (noon to 1 pm), incuding the annual Chihuahua racing competition, jalapeno-eating contest (3 pm), a car show (9 am to 4 pm) with cash prizes, and a grito contest at 9:30 pm. The grito is the fearsome Mexican Scream, says Wikipedia. AVEI / LSUS Sat, May 7 , a photo by trudeau on Flickr. 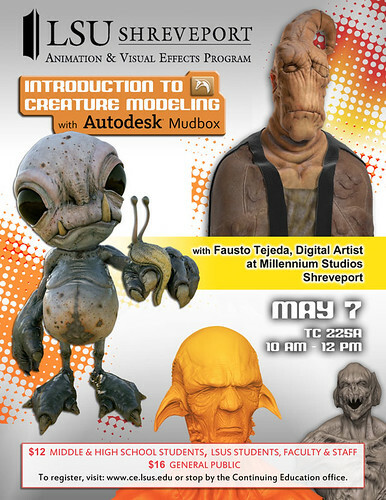 Fausto Tejeda will be giving an Introduction to Creature Modeling using Autodesk Mudbox, says the Animation & Visual Effects Institute at LSUS. Mudbox is a 3D digital sculpting and painting application which allows modelers to sculpt without worrying about the technical details of modeling. Tejeda is a Digital Artist at Millennium Studios in Shreveport whose work includes the 2011 film Drive Angry. The workshop will be held from 10am to 12pm in Room 225A of the Technology Center. The cost is $12 for Middle and High School Students, as well as for LSUS students, faculty and staff. The cost is otherwise $16 for the general public. Maker's Fair, Spring 2011, a photo by trudeau on Flickr. "We are comfortable with the estimate of 2000 people passing through the Texas Avenue / Shreveport Commons area as they attended the Texas Avenue Maker's Fair and Asian Fest on Ap 30," says April Dahm. Dahm and her Texas Ave Community Assoc (TACA) board initiated the Maker's Fair with a 2-Saturday opening in October. There were 61 vendors in what was advertised as "Not your momma's crafts fair." The Maker's Fair held in April featured 81 vendors. "And all the food sellers sold out!" noted Dahm. Dahm said the Fair cost about $1200 to produce, including insurance and police support. 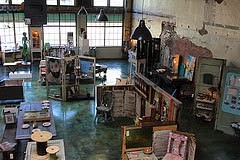 The production was aided by Theresa and Greg Juneau, owners of the triangular site at the corner of Common and Tex Ave. The covered parking center provided weather protection for the vendors and enabled the fest to partner with the Asian Festival, since the 2 groups had adjacent sites. The efforts of numerous volunteers enabled TACA to keep costs low. Vendor's tables were $10 each. "My core volunteers included Conchita McElwee, Christy Kirkley, Garrett Johnson, Allison West, Chris Jay, Sara Hebert, Amy Lynn Scott, Nathan Treme and Kern Courtney. Stepping up to man the registration table were Debbie Engle and Alan Dyson. Chris Alexander helped, too," said Dahm. The TACA board also participated. One part of the bargain pained Dahm: "The musicians volunteered their labor and art." Dahm plans to make musicians' pay a priority in the next Maker's Fair, being scheduled for November. Designed to draw people downtown to enjoy the beauty of historic Texas Avenue, the fair has become an economic incubator. "Vendors like Jennette Ginsberg (decorated hula hoops) and Christy Kirkley (stuffed animals) are now selling their items year-round," said Dahm. TACA is taking note of complaints so as to hone the event. "There were some disgruntled vendors who had tables in spots they thought were not ideal," admitted Dahm. "There were a few complaints about the volume of some of the musicians, too." - Heliopolis Coffee, roasted locally by Jeremy Caudill. - Juice bar with wheat shots by Brittney Maddox. 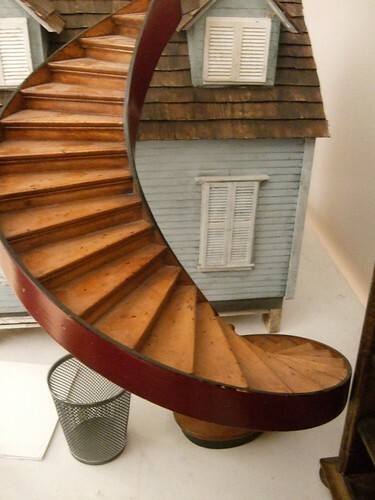 - Welded iron architectural details by musician-welder Jimmy Cousins. - Minicine's Art Show across the street from the Fair at 846 Tex Ave.
- The Pursly Girls colorful hand-made purses - which sold out. -Sno-cones vended by Robert Baucum, soon to open a New Orleans-style restaurant on Fern Ave.
- Bon Temps Burlesque dancers around dancer-organizer Waneta Walmsley, pushing the May 20 - 22 "Paint the Town Red" show. 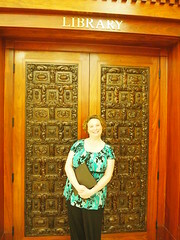 - Storytelling by LeVette Fuller, new Young Adult Librarian for Shreve Memorial Library. 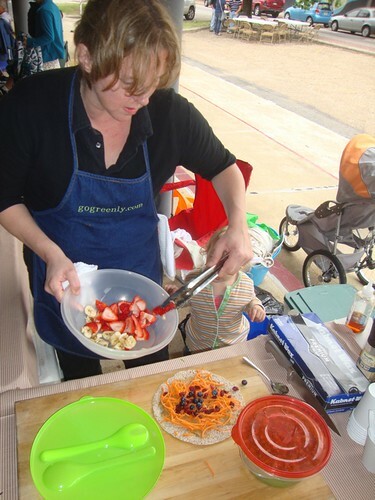 Photo: Libby Smith, gogreenly.com, serving an almond-paste fruit wrap. 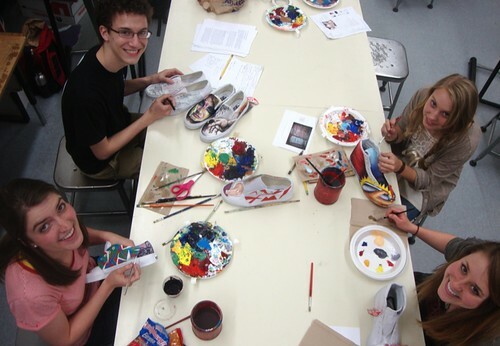 Vans.com/customculture / vote for Caddo Magnet High art dept, a photo by trudeau on Flickr. The Vans.com/customculture shoe painting competition will end at 11:59 EST today, Mon, May 2. The only school from Louisiana in the competition is Caddo Magnet High. Check out the numbers. The awesome Magnet opponent in community vote organization is Eastern High of Louisville, Ky. They have consistently outpolled Magnet - by a few hundred votes - for the week of the competition. 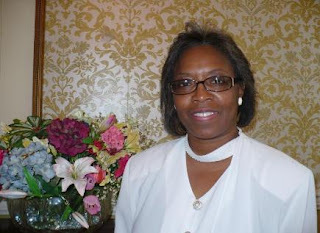 They will be victorious if the Shreveport and Louisiana community is not more effective in reaching out for votes. You'll find the rules of voting as well as a world of art at vans.com/customculture. Takes only a moment to cast your vote. Artbreak 2011 , a photo by trudeau on Flickr. Watch the ad hoc animators wield their chalk and make their characters fly at the Robinson Film Center / Moonbot Studios animation center at the Shreveport Convention Center. It's the annual color fest called ArtBreak and runs through Sunday, May 1, 12:00 noon – 5:00 pm. Another new and cool item: the giant puppets and cardboard maze crawl-through world of the Fantastic Mr Fox. Easy parking, an acre of art and activities; highly recommended.